Monday September 1st 1924 It is thirteen years today since Mother died and Fannies Father was buried that day. It rained in AM. Hattie here in PM. I knit on bead bag. 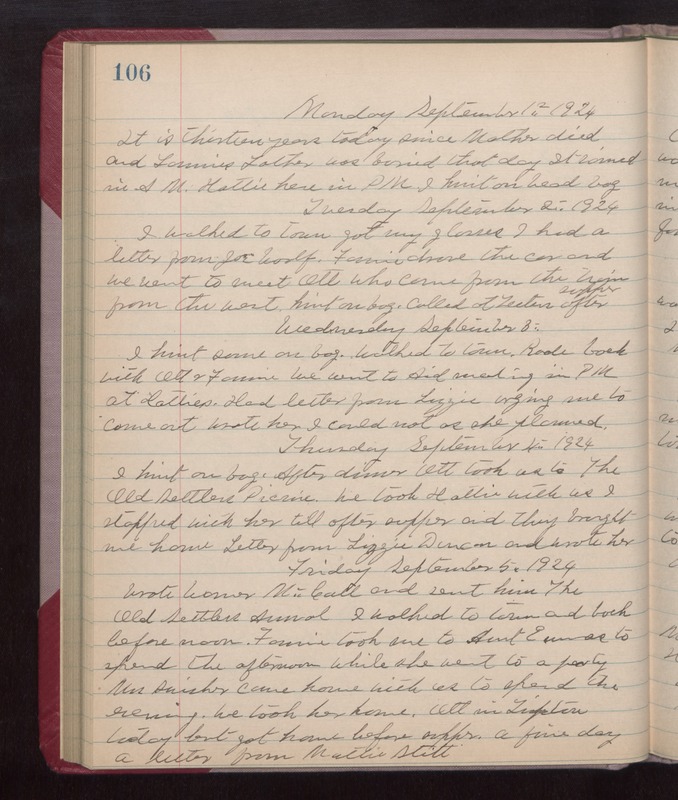 Tuesday September 2nd, 1924 I walked to town got my I glasses. I had a letter from Joe Woolf. Fannie drove the car and we went to meet Ott who came from the train from the west. Knit on bag. Called at Teeter after supper. Wednesday September 3rd I knit some on bag. Walked to town. Rode back with Ott & Fannie. We went to Aid meeting in PM at Hattie. Had letter from Lizzie urging me to come out. Wrote her I could not as she planned. Thursday September 4th 1924 I knit on bag. After dinner Ott took us to The Old Settler Picnic. We took Hattie with us. I stopped with her till after supper and they brought me home. Letter from Lizzie Duncan and wrote her. Friday September 5th 1924 Wrote Warner McCall and sent him The Old Settlers Annual. I walked to town and back before noon. Fannie took me to Aunt Emmas to spent the afternoon while she went to a party. Mrs Swisher came home with us to spend the evening. We took her home. Ott in Tipton today but got home before supper. A fine day. A letter from Mattie Stitt.